Each teen has different trouble areas. One child might find math tough while another child despises writing essays. Very few students are masters of every subject. But when it comes to high school graduation, there are clear requirements that force students to face their most dreaded subjects in order to earn the credits needed for the diploma. 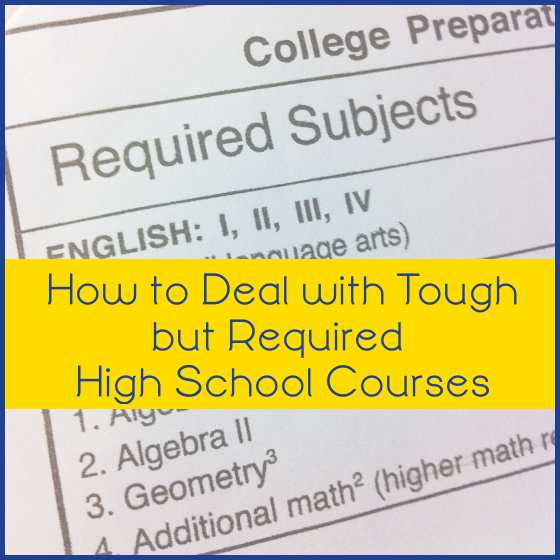 What are some ways to handle these tough but required high school subjects? One way is to knuckle down and invest the minimum required to satisfy your state’s requirement. Do no more, no less. Do just enough so you feel that you have been true to the requirement but have not tortured your child with a difficult subject. Don’t require your child enjoy the subject or go above and beyond. Just get it done. 2. Invest in tutors, online classes, or co-op classes. When learning is hard, sometimes you need back-up. There is no shame in calling in a pro for the tough subjects, especially if teaching your child is causing conflict between you. It’s easy to create mental blocks when it comes to subjects we don’t like. And that negative attitude can carry over into the parent-teen relationship if you are trying to help with a difficult course. Put some distance there by hiring out the work to someone else. I have used both online classes and local co-op classes with great success. Having a fresh face doing the teaching often brings clarity to confusing subjects and injects variety into the routine. And if your teen faces frustration, it isn’t associated with you. 3. Vary the instructional method to meet learning styles/preferences. Yes, it’s high school and the demands should be greater than grade school, but that’s not to say that credits have to be learned in a purely traditional way. Don’t be afraid to supplement the textbooks and tests with more engaging and authentic projects — internships, interviews, travel, reports, demonstrations, speeches, physical projects, etc. Note: When you supplement don’t just add to the existing work load. Instead substitute some of the traditional work with other techniques. If reading is a chore, use audio books to help your child manage the difficult classics. He is still mentally processing the material whether he is reading with the eyes or listening with the ears. It’s not cheating. It’s an alternative method of learning. Yes, your teen can retake a test if his score was not satisfactory. There is no reason not to make A’s if your teen is willing to invest the work in reviewing and trying again. Realize that public and private school children are allowed this same concession. Teachers never want a child to fail a class; they want students to learn. Studying a test and retaking it is a great learning opportunity. Jimmie Lanley is the mother of one creative teenaged daughter. Living abroad in China necessitated the original choice to homeschool. But now that she and her family are back in Tennessee, Jimmie can't imagine any other way to educate her high schooler. Jimmie's Collage is where she blogs about homeschool. In the early years, Jimmie's lesson plans were full of hands-on activities and lapbooks. As the years passed, she began using more and more notebooking and became so passionate about the method that she created her second blog, The Notebooking Fairy. That site features free notebooking printables and how-tos plus the affordable eBook guide Notebooking Success. Jimmie is co-owner of iHomeschool Network, a social media company. Copyright © LetsHomeschoolHighschool.com. All Rights Reserved.